Dampers are to a piano what brakes are to an automobile. 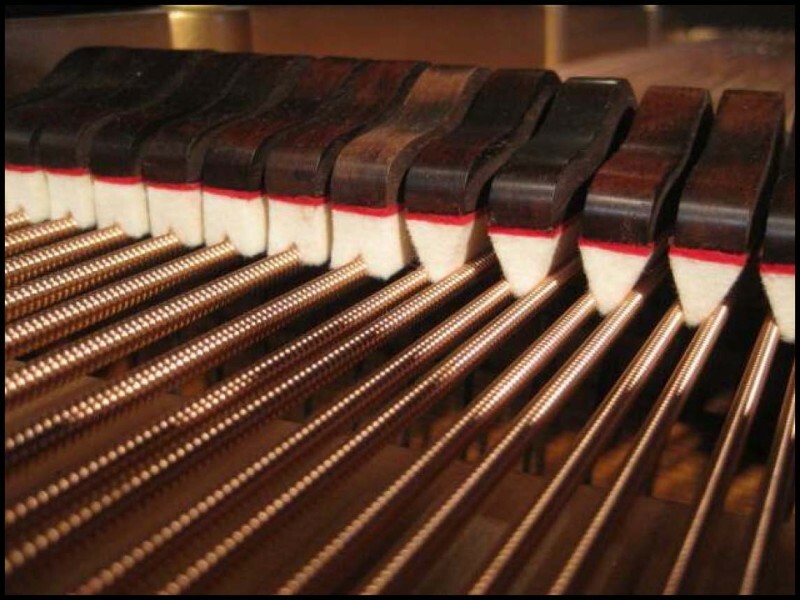 While the action, strings and soundboard of the piano are all devoted to the production of sound, the sole purpose of the dampers is the cessation of sound. The fact that a grand piano can go from a thunderous crescendo one second to nearly complete silence the next is a testament to the genius of the design of the grand damper. The dampers on your piano, however, have reached the point in which their effectiveness has been compromised by wear and tear. Replacement of the old damper felts with a set of new highquality dampers is the solution. What are the symptons of dampers which have excessive wear and tear? Just as wornout brakes on your car announce their condition with unwanted sounds that are characteristic of the problem (highpitched squealing or scraping noise upon braking), so will wornout dampers be detectable by what’s heard when the piano is played. 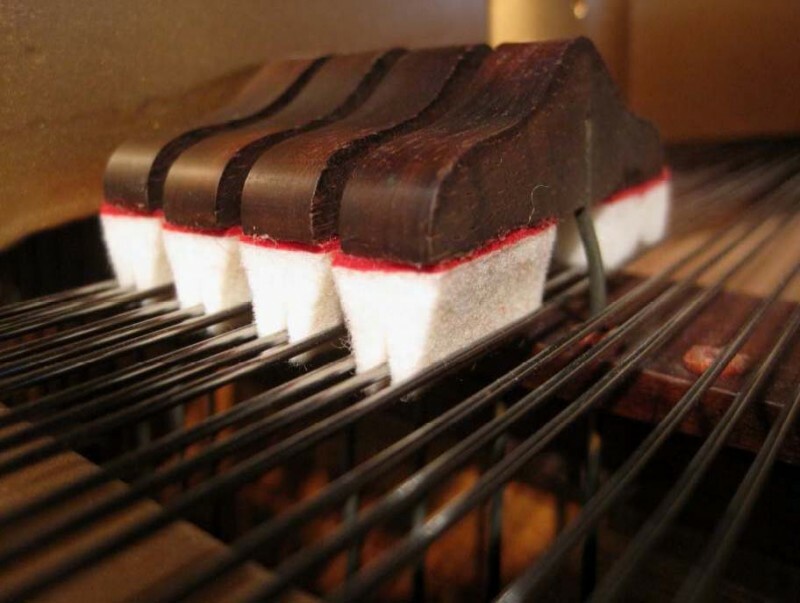 Specifically, when the sustain pedal is released, the transition from sound to silence won’t be immediate, but will be more prolonged than usual—a symptom of ineffective dampers unable to quickly absorb the energy of the strings. Also, when individual notes are played, a faint “zinging” sound might be heard after the note is played as the strings buzz for an instant against the harder than normal surface of the old felt. How do effective dampers work, and what happens to them physically as they wear out? A damper has the ability to absorb the energy of a string hundreds of times as massive as itself and to quell its vibration in a splitsecond. For this to happen, the damper material must be firm enough to hold its shape (damper on left in above photo) but soft enough to instantly muffle the sound of the strings. 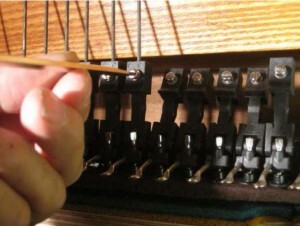 Precision alignment of the dampers on the strings is also a necessary factor. Dampers often become hardened or misshaped with age, as seen with the damper on the right in the above photo. The treble dampers in the photo to the side illustrate clearly why wornout dampers do not function as intended. In such a case, replacement of the old dampers with a new set is the only option. Unless the piano is in the workshop for an extensive restoration work, there is no reason to transport the instrument to the shop. However, it may make sense to take the damper assemblies to the shop for at least part of the work to be done. To access and remove the damper assemblies, the case will need to be disassembled to the extent that the action and keys may be drawn out of the piano. 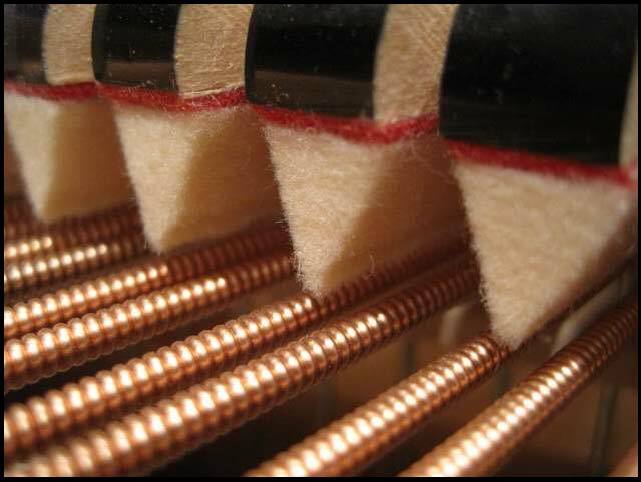 After removing the action from the piano, each damper will be taken out in order by loosening the set screw which holds the damper wire in place. 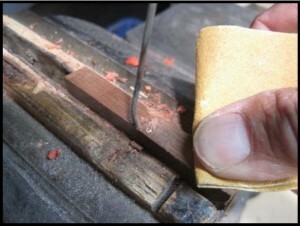 The wooden blocks that the damper felts are attached to (known as the damper heads) are ordinarily saved. 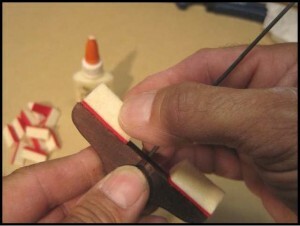 The old felts are removed with a sharp chisel. While this job could be done in the home, the tools and equipment of the shop (such as the bench vise being used in the photo to the right) make the process simpler and more precise. The lower surface of damper head is then scraped and sanded clean. The upper surface of the damper head may be cleaned and polished if the original lacquer finish is still in good shape. Otherwise, the old finish may need to be stripped off, so that a new lacquer finish can be applied (noteextra work =extra cost). A final step will be the polishing of the damper guide wires. 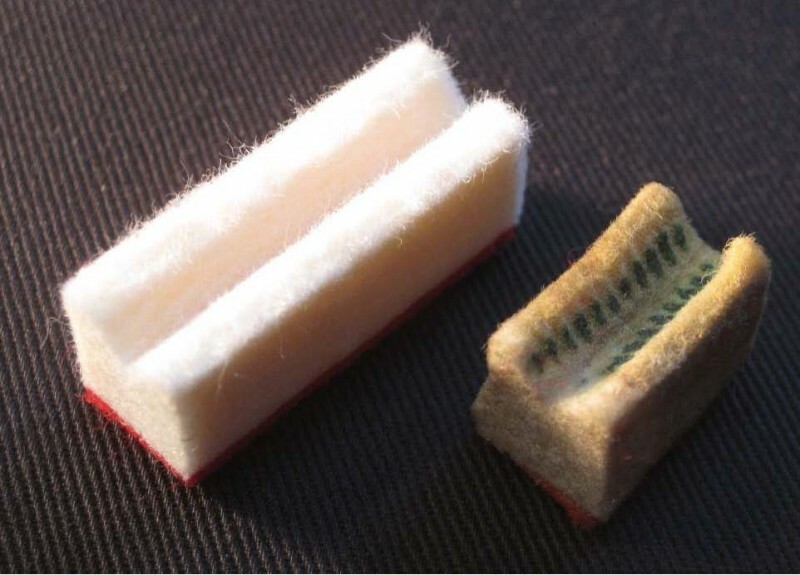 Once the damper heads and guide wires have been attended to, new damper felts will be glued in place, usually at the piano. 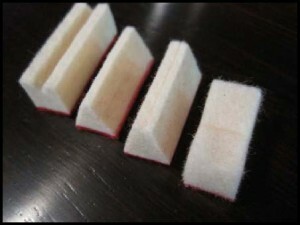 High quality, precut damper felts are available for many grands. 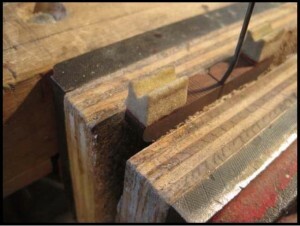 At other times, felt may be cut from strips so that the length of the dampers is precisely fitted to the damper heads. 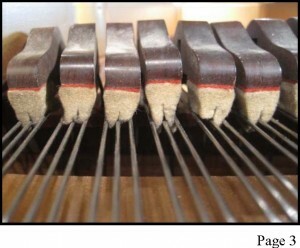 Many times, the preferred practice is to reinstall the damper heads and wires in the piano, then glue the damper felts in place, using the strings themselves to serves as the clamps while the glue dries. This way, alignment of the felt to the strings is sure to be precise. Yes. If the piano is in need of restringing, now would be the time to do it in that the two jobs compliment each other. Since the dampers conform to the strings (especially the wound bass strings shown in the photo above), it makes sense to have new strings and new dampers installed at the same time. Additionally, the condition of the damper guide rail should be taken into account. If the bushings that the damper wires pass through are worn, this would be the obvious time to rebush the guide rail. Once the damper felts are glued in place, is that all that needs to be done? No. There is always a great deal of fine adjustment involved to finish the job. The dampers must lift as a unit (above photo), giving the appearance of all being solidly connected. When the dampers lift, individual damper heads should not be seen swiveling one way or the other in random directions. Most importantly, when the dampers make contact with the strings upon release of the sustain pedal, they must all touch at exactly the same moment in order for cessation of sound to be precise. Complicating this adjustment is the fact that different types of dampers are used for different sections of strings, and the profiles of these various dampers are not the same at all. 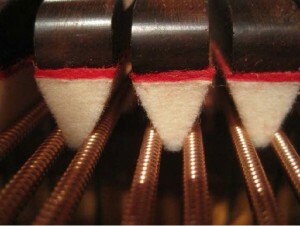 In the photo to the right are shown single wedge dampers (used for the largest bass strings), double wedge dampers (used for notes with a pair of bass strings), trichord dampers (used for larger steel treble strings, and flat treble dampers (used for smaller steel treble strings). Obviously, a great deal of fine adjustment is necessary to make all these parts perform in unison with one another. A new set of dampers installed and ready quiet things down when needed.